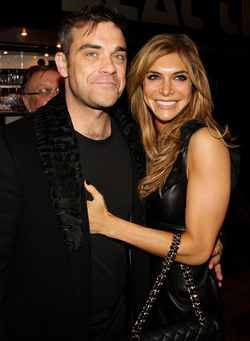 LONDON — British pop singer Robbie Williams says he and his U.S. actress wife Ayda Field are expecting their first child this year. Williams — the voice behind hits such as "Kids" and "Angels" — took to his blog on Friday to tell fans that he has "been keeping a secret." The 38-year-old star's blog post says he and his wife "had seen scans and cried" in happiness at the news. He says the nursery is already planned and he "can't wait to be a daddy." Williams rose to stardom first as a member of the boy band Take That in the 1990s, and later when he pursued a solo singing career with tracks such as the popular "Millennium." He and his wife tied the knot in August 2010.